The rooms were fantastic!! It was super close to the Berlin Tegal airport. The overall hotel experience was wonderful. Would definitely stay there again. Comfortable hotel and clean property. They had a restaurant with good food and reasonable prices! And it was opened until 10:30PM which was very convenient. Very comfortable king size bed and nice breakfast. Staff, breakfast, restaurant food, fitness, pool, spa. The staff was very helpful and the hotel was remodeling but we never encountered any inconvenience or even notice that it was remodeling! Beautiful and clean! Close to airport; comfortable. Decent menu and obliging staff. The room was very clean and the property was very close to U7 to reach the centre of the town quickly. The staff was really friendly and nice. We left before the breakfast and there were some nice complimentary breakfast items for early travelers. The baby crib was really nice. 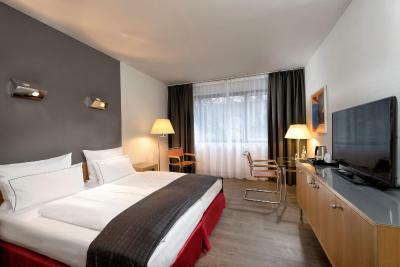 Holiday Inn Berlin City-West This rating is a reflection of how the property compares to the industry standard when it comes to price, facilities and services available. It's based on a self-evaluation by the property. Use this rating to help choose your stay! This hotel offers a free leisure area with pool and large and soundproof rooms with flat-screen TV. 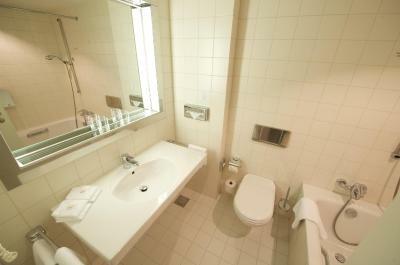 It is an 8 minute drive from Tegel Airport and a 5 minute walk from subway trains. It also provides excellent connections to the Messe Exhibition grounds. 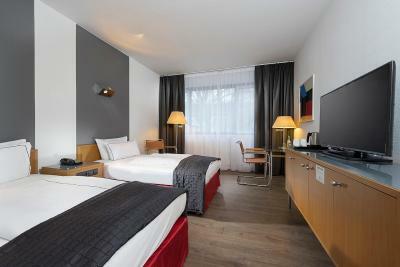 The air-conditioned rooms at the 4-star Holiday Inn Berlin City-West are at least 269 ft² in size. They have cable TV and a bathroom with hairdryer. The Holiday Inn Berlin City-West offers shuttle service to/from Tegel Airport. Rohrdamm Underground (subway) station provides access to the city center. 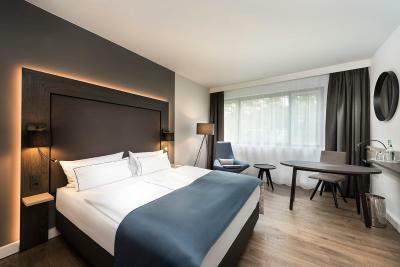 The Holiday Inn is in the Siemensstadt area of Berlin-Spandau, within walking distance of international companies such as Siemens. Spandau is a great choice for travelers interested in shopping, sightseeing and city trips. 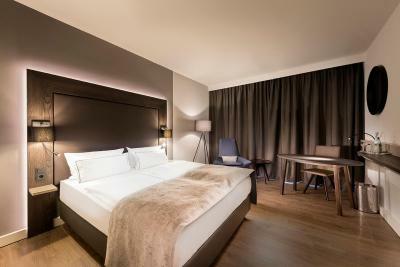 When would you like to stay at Holiday Inn Berlin City-West? 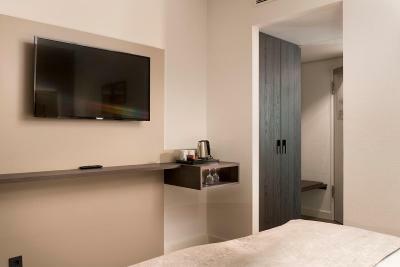 Soundproof suite with a flat-screen TV, air conditioning, and private bathroom with a hairdryer. Also has separate living and sleeping areas, a sitting area with sofa, and a separate dressing area. Bathrobe included. This twin/double room has a minibar, cable TV and air conditioning. 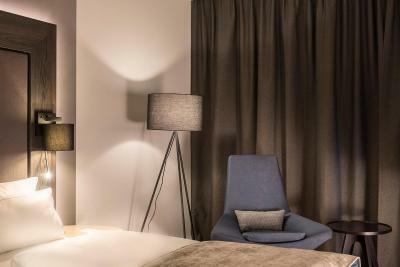 This double room features a electric kettle, sauna and air conditioning. This double room features air conditioning, electric kettle and sauna. This double room has a sauna, electric kettle and air conditioning. 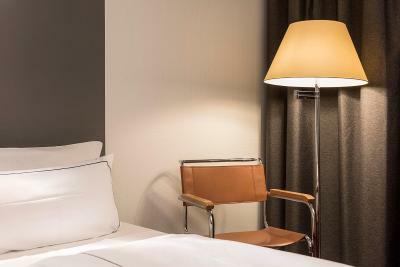 House Rules Holiday Inn Berlin City-West takes special requests – add in the next step! Holiday Inn Berlin City-West accepts these cards and reserves the right to temporarily hold an amount prior to arrival. Please note that the parking fee is EUR 20 from Monday to Friday and EUR 15 on weekends. We booked this hotel for our colleagues to visit the Berlin office. Upon their arrival they first could not find the fully prepaid rooms under the booked names. After some hassle they finally found it, however the room key of our managing director was not working properly. No entry to his room, room swap was apparently not possible and they needed to ask some maintenance personnel to fix it. After a long wait. Second try, the door was not opening, so finally they could swap room, while the first time they said it was not possible. Our director entered the room 12.45 past midnight because of the lousy service of this hotel. During this situation they never apologised for this inconvenience, no offer of even some drinks or water. The worst part of this situation is that they can't even put a well educated/ normal face on, as if they were forced to work in a hospitality industry. The service and attitude is not on par with any standards. Once again, if you don't like hospitality, don't work in this industry. We will NOT book this hotel anymore. And remember this was the second booking in one month time. Bye Holiday Inn Berlin City West. Location was best for visiting our office in Berlin. Bar & lounge staff were not friendly and helpful at all. its not a real value deal unless they include at least a continental breakfast into the room rate and/or offer free shuttle to TXL. Check-in and check out process went smooth. reception staff were helpful. room was clean and bed was comfortable. Its about 10 minutes far from TXL. Pool area was closed and the food was medicore. long check in and check out queues. We need to take a taxi to go to the airport beacause our flight was too early morning. Our room was well cleaned up and spacious for us. stuff was friendly. It would be an ideal stay if you have an early flight. Loud music could be heard in rooms but eventually rooms were changed. No drinking water in taps due to construction but only found out after I had drank some. However, hotel staff brought some jugs of water to room. No hotel shuttle on a Sunday at a hotel that advertises this service. But hotel rang a taxi. Pool not open. Booked so son could use. Pool was closed, during the ordering I was not informed about that, though I wanted to use it. Disappointed. Rooms were comfortable, low noise. I had no breakfast due to the early flight.